The lower tree-covered hill at left, its forest being the Hospital Plantation (taking its name from the white building at centre, now a restaurant, but origianlly a sanatorium or hospital), is the unnamed extension of the Sleet How ridge, and target for the cable-car top station. Their map of proposed tourist development. The proposed route as it should be . The actual proposed route swings in an arc across the top of Comb Beck ravine and curves under Bob's Seat. [see previous map] Highly suggestive that this has not been looked at by Doppelmayr! The location of the base station in that field places it 50-60m from Ladstock Hall. 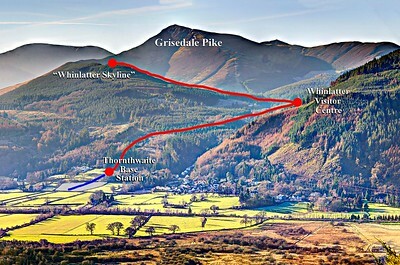 To avoid all parking issues in or around Thornthwaite the gondola, being fed, as it is proposed, by shuttle buses from Keswick, should start from the A66. The purpose of this tourist attraction is not to be an innovative transport solution to carry tourists up to the Whinlatter Visitor Centre. That is incidental. 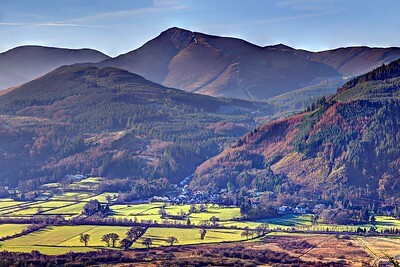 The purpose is to uplift high-spending overseas visitors onto the north-east ridge of Grisedale Pike. The extension to Ullister Hill seems pointless and unlikely. But it could be the drag-line for a so-called 'Alpine Slide'. 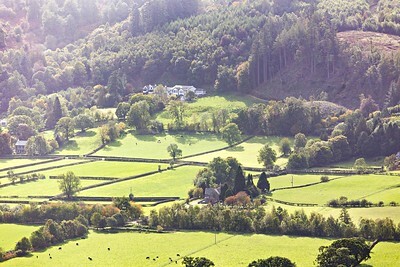 If the parking in Keswick and use of shuttle buses isn't implemented the car park could spread across all the fields shown. The car park for the comparable Aonoch Mor system and the Sea-to-Sky Gondola in Squamish, Vancouver, in both cases, is for more than 400 cars plus coaches. The higher field, alongside Ladstock Hall, is the one shown on the planning application. 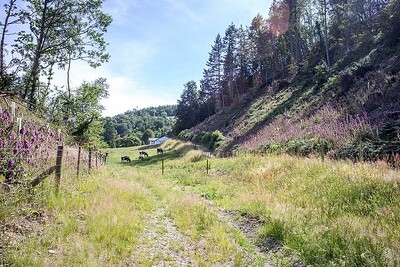 The lower field with the cows, is needed for access. Ladstock Hall would be no more than 50-60m from the station. The house 'Sour Riggs' (left) would be 150-200m. 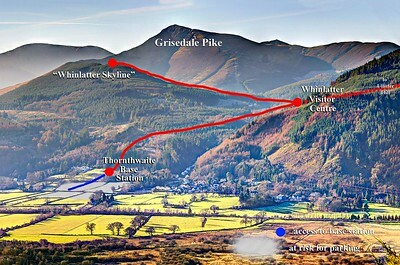 The Top Station from Grisedale Pike north ridge. An early attempt at a simulation. Whatever form the building takes, it'll go there. 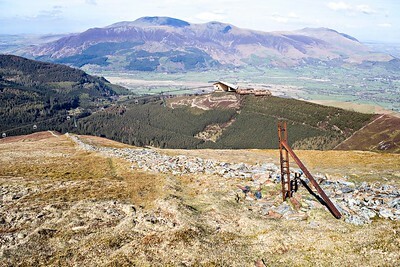 Viewed from Grisedale Pike. Scale: a 3m wide Landrover track below the station. 1m wide MTB trails elsewhere. Trees below the pylons are relatively new plantings and only 3-4m high. It's admitted that the gondolas, borrowed from Matlock's Heights of Abraham, are somewhat oversize. Building here is in clear contradiction of Section 36 which decrees that there will be no damage to the skyline. Pylons out of picture, left, will be much higher where they step across the Comb Beck and the road to the visitor centre. 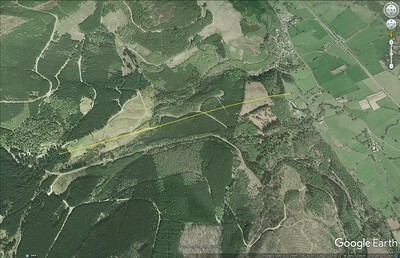 Location of the middle station is unknown but could be on the slopes above the Centre's buildings, in which case pylons will be significantly higher. The line from Ladstock to the Visitor Centre. Exact location of the middle station is unknown but, one possibility is on the site of the bungalow that can be seen beyond the tall pine. However, as cables can't do 90 degree bends, the middle station will effectively be two stations, one for each leg of the journey. Pylons could be higher than shown. Aonoch Mor website tells us that, for their project, each station took 200 tonnes of concrete. No figure given for concrete bases to the pylons. 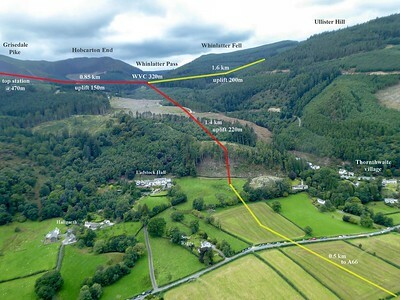 Aonoch Mor is a single straight line with 18 pylons, so we'd expect the same number for Whinlatter. Visitors to Bob's Seat (the open brown patch at 320m/1050ft on the hillside at right) might be amused to find themselves looking down on the cable car line. With the route running parallel to the road, passengers in the gondolas might be surprised to find that they'd paid £21 each when they could have simply driven up. Seen from the new osprey viewpoint. Looking up to the 'Whinlatter Skyline'. To place a building there would be a clear breach of policy not to damage the skyline and is, therefore, an astonishing proposal. The lane leads from Thornthwaite village, 150m off camera, left, to the proposed base station field. Note the gate at left. There is concern that this could be used to access the facility. A crude depiction of the base station location and the route from it up the hillside. An ascent of 50m. The Field : Location of the base station. Outline to suggest size of the building. Comparison with Aonoch Mor stations suggest this is undersized. As seen from Lord's Seat. Unseen from the valley below. 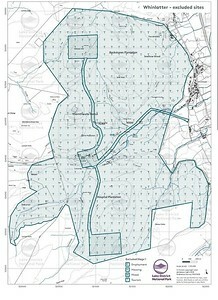 Certain to be affected by light polution from Cockermouth, Maryport and Whitehaven, not to mention Keswick itself. Another unkown: whether anyone has gone up and 'wild-camped' up there to test it before proposing it. There are so few cloud free nights - and most seem to be in winter.